My first attempt at holiday candy making was nearly 50 years ago. I knew asking my mother’s permission to make some wonderful treats on the stovetop would result in a well-founded, “No!” So I discovered that feigning sickness while the rest of the family was away for the day would give me the freedom needed to spend entire days alone in the kitchen. My truancy became a habit, and once everyone left for work or school, I’d settle into our kitchen and pour through Mom’s double volume of Meta Given’s “Modern Encyclopedia of Cooking.” I treasured those worn green books (as I do to this day) and the possibilities the gorgeous colored pictures presented me. Especially appealing that day was the holiday divinity—little fluffy pillows of sweet white goodness—and how hard could it be, I wondered, to boil some sugar and water then pour it into whipped egg whites? The anticipation of sharing these little gems around the neighborhood was nearly too much. Carefully, I measured the sugar and water and poured them into Mother’s shiny copper-bottomed Revere pan. Back then I was a somewhat impatient cook and believed high heat would get me to the next exciting step a bit quicker. I don’t recall how long I left the saucepan unattended, but somewhere between the softball and hardball stages of boiling sugar, I discovered blackball. The lid began rising from the pan, and an unstoppable mass of black sugar/soot erupted. Grabbing the pan, I headed outside and threw it to the ground. While the pan smoldered in the yard, I ran back to the kitchen to survey the damage. Other than a few hard globules of burnt sugar here and there and a smoky black ring around the burner of the otherwise white and pristine appliance, I found little damage. Back outside, the pan was another story. Even with the adrenal rush triggered by fear of discovery and corporal punishment, I was no match for the lid and pan, firmly welded together by the sugary charcoal. With cooled pan in hand, I raced across the street to my pal Irene’s home and pleaded with her older sister to help me out. We managed to separate the pan and lid and Halina halfheartedly scrubbed off a layer or two before I left with my stained pan. Back home, I continued to scrub, but upon hearing someone come in the back door, I quickly hid the evidence. Finally, besieged with parental fear, I showed the pan to my older sister Linda and begged for her help. Moved not by sympathy for my plight but by the aftermath that would ensue upon our mother’s discovery of another kitchen disaster, Linda glared at me and she scrubbed the pan, nearly to its original sheen. How my mother could tell I’d been cooking was a mystery to me. But she knew. And that was the occasion that became too much for her as I was admonished and threatened with a lifetime ban from the stove. Years later she reflected, “I can’t believe you never burned our house down.” Frankly, I can’t either. I once attended a week-long course at the French Pastry School in Chicago. The session, Fine Chocolates and Belgium Classics, was taught by noted Belgium chocolatier, Chef Jean-Pierre Wybauw. Dressed in mandatory kitchen whites, from toque to toes, we learned the theory and specific gravities of syrups and sugars. With scientific precision and calibrated thermometers, we whisked and boiled our ingredients to meet the standards set forth by our instructor. At week’s end we showcased our masterpieces and awaited our critiques by the Master Chocolatier. My mother would have been real proud. Somewhere between these two experiences I found my place and pace in the world of candy making. While I still gather a lot of inspiration thumbing through cookbooks, now I understand the fundamentals of the process, from pretty pictures to execution. During the holidays, the kitchen is my studio, and you’ll find no less than a dozen edible works in progress: pecans to roast, chocolate to temper, cookies to frost, cherries to dip and, very carefully, there is sugar to boil. Grandson Will just reported to his preschool teacher, “Mimi is coming for Christmas and she makes yummy treats.” I’m sure you have your own yummy holiday treats, and I’ve included a couple of my recipes for you to try as well. If you’re daunted by tempering chocolate (the process of heating and cooling chocolate so it stays shiny looking), there are some great tutorials on YouTube. If you are still unsure of the process, you can cheat and thoroughly stir a couple drops of vegetable oil into the melted chocolate for your own shiny results. Here’s to your holiday inspiration, precision, lots of sugar and love. This is a fabulous holiday candy, with only three ingredients, though you can be creative and add other nuts, dried fruits or coconut as your heart (and palate) desires. •Line a 4×8 bread pan (or similar size rectangular or square pan) with foil and smooth so there are no ridges. •Tear the marshmallows and set aside. 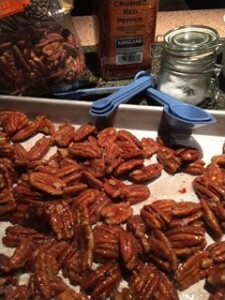 •Toss the chopped pecans in a heated fry pan and give it a few shakes, toast until they are fragrant. Don’t overcook! Cool. •If using chunks, chop the chocolate, melt in a double boiler and temper (or add a couple drops of vegetable oil and blend well). 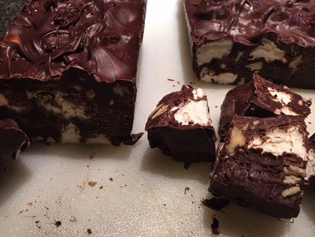 •Cool the chocolate to about 85 degrees, add the marshmallows and pecans and fold just to coat them all nicely with chocolate. Pour into pan. Give it a couple gentle taps on the counter to settle and fill the corners. •Cool away from lights. When firm (2-3 hours), carefully remove from pan, remove foil and wrap tightly with film wrap. When ready to serve or package, cut into squares with a sharp knife. Store in airtight container so the marshmallows stay soft. Fast and easy to prepare and if you like them spicier, add more chili flakes. Be prepared to make several batches, they’ll disappear quickly to rave reviews. •In a small bowl beat the egg white until frothy. Add the sugar, paprika and chili flakes. Stir in the pecans, mixing until well moistened. •Spread nuts on prepared pan, make sure they don’t touch. Sprinkle with the sea salt. Bake in preheated oven for 30 minutes, stirring once or twice. Be careful not to overcook and burn the nuts! When cool, break apart, peel the paper away and store the nuts in a covered container.